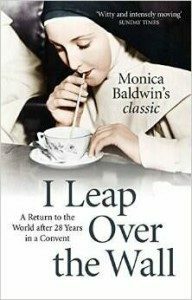 Given that Monica Baldwin’s I Leap Over the Wall is perhaps the most famous book ever about leaving the convent, it’s surprising that it took me so long to read it. Or perhaps not. I’d read Father Richard Butler’s analysis of it in his book Religious Vocation: An Unnecessary Mystery, in which he thoroughly criticised her understanding of vocation, and other authors I’d encountered had also written about its shortcomings. So it was with some trepidation that I picked it up in my local library, and made a startling discovery: this book is funny. Perhaps I should qualify that. Episodes from the author’s post-convent life (especially her work in a camp for munitions workers) can be harrowing, but she brings to everything a wry, ironic, and exquisitely British sense of humour that keeps it from getting weighed down. Baldwin was a genteel young woman of twenty-one when she entered an enclosed monastic community in 1914, and she returned to secular life in 1941 to find the world turned upside-down by two World Wars. I Leap Over the Wall is the story of her attempts to deal with new social mores (“an object was handed to me which I can only describe as a very realistically modelled bust-bodice. That its purpose was to emphasise contours which, in my girlhood, were always decorously concealed was but too evident”), find paid work (“who, in these days of battle, murder, and sudden death, wanted illuminated addresses or initial letters from the Tres Riches Heures du Duc de Berri, or the Book of Kells?”), assist in the War Effort (“nobody who was not actually fingered one can have any idea of the degree of iciness to which a brussels sprout can attain if it really makes up its mind; nor of the rapidity with which this iciness can be communicated to the hands of anyone who attempts to sever it from its parent stalk at half-past eight on a cold and frosty morning in the early days of March”) and to try to catch up with a society that had left her behind in every way. Her narrative is carefully structured: she’ll begin with an episode from her post-convent life – for example, people-watching in a stuffy train carriage on the way to the latest in a string of job interviews – and then shift into a comparison with religious life. (In this case, it was a discussion of the conflict between the two types of nuns one finds in a monastery: the Fresh-Air Fiends who want the windows open in every sort of weather, and the Fug Fiends who always want them closed no matter what.) She writes about her time in the convent with a blend of warmth and tension that anyone who has faced a violent interior battle to stay in religious life will understand perfectly. Occasionally, her detached story-telling style will shift into something like poetry as she describes, say, the hand-woven lace on the altar linens used in her community: “cream, foam-colour, ivory, linen-white, ghost-grey or palest oyster – all the faint, indescribable quarter-tones between white and white that exist only in lace; most of it was well over a yard in depth” or the rich pigments which she laid out for the work of illuminating manuscripts. Not that she can’t speak eloquently about the hardest aspects of religious life, too. But she isn’t bitter; if she suffered from the cold as a nun, she also suffered from the cold as a farm worker in her post-convent life, and doesn’t see fit to say which experience was worse. And, always, her descriptions are handled with a touch of self-deprecating humour that lightens the tone. Thank you for this word – didn’t know there was such a word ?